1. Have a goal other than “I just want to eat steak.” Revolutions tend to involve casualties and lots of them. Most revolutions have an ideology behind them, but it’s basically starting a war. Are you absolutely certain having steak (or whatever the ideology) is worth your life, the lives of your fellow revolutionaries, and the people you are revolting against? 2. You don’t know everything. The reason for your suffering may not be clear until after your revolution. When stuck on a train caboose for 17 years, you are certain to not have enough information. The information you do have may turn out to be a lie. In addition, you should prepare yourself for the possibility that your suffering may be entirely or mostly your own fault. Others may have had the foresight to prepare for their future and/or the case of a world-wide disaster, and you did not. You should be prepared for the possibility that what little good you do have is at the benevolence of others smarter than yourself. What these others are doing may be the only way they know to ensure the survival of either themselves or the entire group. Your own lack of foresight will not, in their eyes, justify you taking away everything they have built up. Be also prepared for the possibility that others are suffering even worse than you are. 3. You may be worse off than you were before. Revolutions are uncertain. You may be only making the way for a new, more violent dictator or absolute anarchy. Revolutions are chaos, and large numbers of people cannot live with chaos for long. Anarchy is often corrected by tyranny. Your goal should be worth risking that possibility. (The country of America laid out their government in a specific arrangement in order to prevent tyranny and one person or group gaining too much political power. In recent decades, this system has been messed with and we see our officials abusing their power). 4. Many, many people will die. Today, even after a history of hundreds of thousands of deaths, young (and old) people still believe that “equality” is achievable on earth with evil, selfish human beings. They think that the Russians and the Chinese just didn’t do it right. Go ahead, have your revolution, see how happy you feel when you realize you are the orchestrator of the deaths of thousands, if not millions of people. See how happy you feel when the survivors are now starving and cry out for a leader, any leader, to save them. See how you feel when the decision is made that because there’s not enough to go around, a certain number of people will have to be eliminated…by you. This isn’t to say there aren’t things worth dying for, but in instigating an uprising, you are taking everyone’s life in your hands, not just your own. 5. You may become everything you hate. This can happen whether your goal is steak or equality. The reality is that society works best with leaders. And leaders by definition have more power than others. Even the smallest bit of power can corrupt. We see this everyday with children who are spoiled: they become tyrants in their own households. We see it at the post office, the DMV, and in Congress or Parliament. These mini-“leaders” scorn the people they are called to serve. They greedily scoop up benefits and leave little for the rest (perhaps why it’s better to limit government and its benefits). What does all this have to do with Snowpiercer starring Chris Evans and directed by Hoon-Jung Park? Only that while watching the film these are the thoughts that went through my mind. 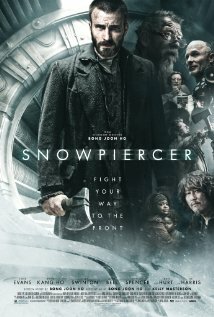 Snowpiercer is at once the story of 1984, Atlas Shrugged, WALL-E and The Hunger Games. To me, all of these stories say one thing: Plan. Have a plan for your life. Have a plan in case something goes wrong. Have a plan in case all goes right. In those plans, strive to attain as much knowledge and as many skills as you can. There may come a day when those plans are the difference between living and dying, the difference between charting your own course or succumbing to tyranny. There are only a few people at the top of society that control everything. The train creator and engineer, Wilford (played by Ed Harris), has set up a society that absolutely relies on everyone having their place, no matter how awful. We see that most people in the cars in front of the tail accept tyranny for safety and creature comforts including parties and drugs. Wilford is essentially a “John Galt” type of person, someone who is gifted in intelligence and other abilities. Instead of leaving the rest of humanity to its fate as John Galt does in Atlas Shrugged, he used his talents to make a train that would at least save some. In this, he is admirable. In addition, he also takes on a number of refugees who do not have tickets. In this he is also admirable. Beyond that, his admirability stops. Is it truly necessary to treat the people in the train so abominably? Wilfred states it’s because of the closed train environment that it is imperative that people die at a far faster pace than they would normally. Resources and space are limited, and a “revolution” is the best way to get people to kill themselves off. Revolutionaries beware. If you are a proponent of population control, you cannot, if being honest, hate this man and his actions. His ideology is to what you too ascribe. What began as a love of nature has now morphed into a world society in which we are all asked to pay homage to the environment, where the world is portrayed as a closed space with limited resources. Yes, it’s the internet, but I have seen way too many comments stating that it would be best for say, a billion people to die for the sake of “saving the planet.” You may someday get what you wish for, but you will not likely get to choose which billion you are a part of. It is sad that smart people like Wilfred or those who support population control do not have the imaginations to find a better way, a way where all can thrive. I also find it absolutely hilarious that in the movie the new ice age begins with people deciding they could save the planet from global warming. It does not delve into the more interesting debate on whether global warming actually exists. None of the people on the train were likely responsible for what happened, and, again, only Wilfred did have the ultimate foresight to build a contraption that saved humanity but gave them a perverse society in the process. In each scenario, we see that good intentions don’t always lead to good results. Again, revolutionaries beware. Snowpiercer uses violence at the expense of storytelling, and that is my one criticism of it. The fights could have been shortened, allowing for a more in-depth look at life at the head of the train. Aside from the brainwashed teacher and the Hunger Games fashioned Mason (Tilda Swinton), we don’t get a clear picture of what the people living the good life actually think about it. They are ready to kill for it, sure, but more depth could have been explored. The two drug addicts played by Kang-Ho Song and Ah-Sung Ko thought outside the box, er, train perhaps because of their habit, but they were veritable corpses before the tail section revolutionaries came along. It is interesting that the partying and drug use was the worst at the front of the train near the engine. A direct picture of all too many governments and ruling classes. It is also shows that drug use is most common at societal extremes. The middle class train cars seemed peaceful and industrious. The exploration of religion was interesting. Many people today believe they are more intelligent if they reject religion or even the thought of a god. But what happens when people do that, especially en masse, is that they find other gods to follow, for humanity has a spiritual void that must be filled. If any of those people had had any sort of religion, it may not have been quite as easy for Wilfred to condemn certain train citizens to suffering and death. The people in the front cars swallowed the religious and political propaganda so easily because they did not have any spiritual views of their own. Wilfred had to become their god to make it all bearable. In this review, I have not said much about the directing, acting, camera shots, colors, special effects, etc., used in the film, but have mostly talked about themes I took from the story. All of those elements were good, as they are in most movies, but Snowpiercer stands out because its themes are food for thought, much food for thought. It’s steak. Chewy, juicy steak on which you can add any sauce you like and still enjoy it.